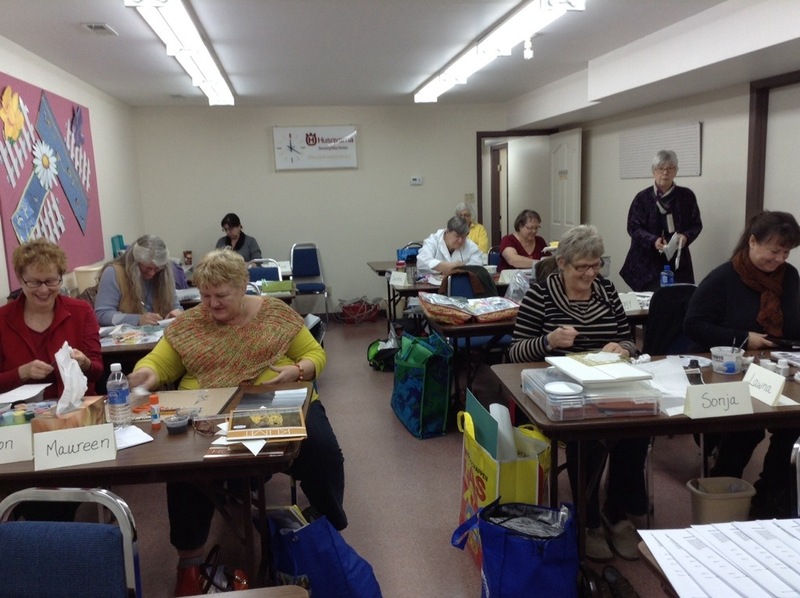 My design workshop in Edmonton for a group of Focus on Fibre Art Association is in full swing. After two days of design exercises and colour theory we are focusing on translating the paper design into a final art piece. Make sure to check back for results later this week. 30 Oct	This entry was published on October 30, 2013 at 7:55 am. It’s filed under Art, Design, Journaling, Studio / Workshop / Creative Space Challenge and tagged Design workshop, Focus on Fibre Art Association, teaching in Edmonton. Bookmark the permalink. Follow any comments here with the RSS feed for this post. Leona, I have noticed a certain demographic in my classrooms. I am also interested in bringing along younger generations and share with them the art of quilting and embroidery – but as you pointed out the young mothers are often stretched in all directions. Between children, household, job and a huge mortgage there is little money left for expensive hobbies and workshops. This particular workshop is free to Focus on Fibre Arts Association members. Going back to the limited time the younger generation has, I remember that I took very few courses when I was working full time and was raising our daughter. I used to steal a few moments here and there in my basement sewing corner – usually to create a Halloween costume, a Christmas dress or nighty. At one point we lived next to a military family. The young mom and I would spent every evening from mid-November together sewing Christmas items for the children, our husbands (she made a dark blue jumpsuit from stretchy material for her husband even – yes it was the 80’s!) and when we had time left – we baked. Where did we find the energy? I would love to talk with you about generating interest in quilting in the younger generation and how to foster creativity even when there is little time in a day.